In addition to its intuitive and versatile user interface, Gyroscope is designed to be flexible and resource efficient. Gyroscope takes full advantage of the LCHH architecture. The main loader is the entry page (index.php), where the menu icons, left panel and tab view loaders are defined. The layout and panel sizes are explicitly controlled by a window manager (viewport.js). The tab view is given the maximum possible screen real-estate. The content in each loader is subsequently loaded through ajxpgn in the Nano AJAX Library. "Building a List View", "Auto-complete Utilities" respectively. 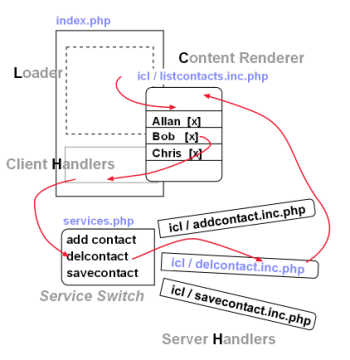 All the server-side handlers are routed in a switch block, which is defined in myservices.php. Note this file can take up other names, as long as the change is reflected in settings.php. The advantage of routing all the handlers through a single file is having a single point of control. The above switch structure distributes the implementation in smaller files; this effectively reduces the memory footprint. Also measure the memory usage of a blank PHP page. You'll notice that the values are usually multiples of 262144, or 1024 x 256. This is the least amount of memory PHP allocates for each script execution. If the script requires more memory, PHP will assign another chunk of 262144 bytes of memory, until either sufficient memory is given, or an error message "allowed memory of X bytes exhausted" is displayed. This chunk of 262144 bytes is called a "segment". Counting segments is more convenient than counting actual bytes. It also eliminates the differences in pointer sizes in various server configurations. Memory footprint has a direct impact on concurrency level, or the number of users the application can support at any given time. Gyroscope honors the golden standard of 1 segment memory consumption. The "C" in LCHH is the content, or server response that's directly injected to the loader. In a typical Gyroscope application, the content consists of textual information, event triggers and pivoting links to other views. When the loader is populated with content, the LCHH cycle moves on.